Part 1 considers the changing role of the warehouse and of the warehouse manager in todays supply chain. Part 2 analyzes the individual processes within the warehouse with special focus on cutting costs and improving productivity. These processes include pre-receipt, receiving, put-away, storage, picking, replenishment, value-added services, and shipping. Part 3 explores the use of equipment in the warehouse, including warehouse management systems, handling equipment, and storage systems. 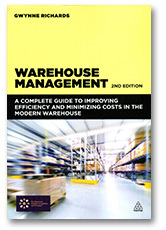 Part 4 discusses how to develop a resource and cost model for current and projected warehouse operations. Part 5 looks at performance measurement in detail and considers why we need to measure, what we need to measure, and how we can use this information to improve overall operations. Part 6 provides insight into current areas of interest for warehouse management including worker health and safety, and the effects of logistics operations on the environment. Fully illustrated with charts, photos and drawings, Warehouse Management is a practical tool for both the novice and the experienced warehouse professional seeking to implement best practices. Gwynne Richards has over 30 years of experience in warehouse management and logistics. In addition to providing a number of courses on warehouse management he is also a visiting lecturer at the University of Warwick and the University of Aston. Warehouse Management is guaranteed. If you are not 100% satisfied, you may return it within 30 days for a full refund.